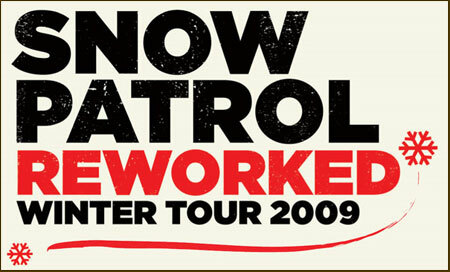 Snow Patrol is one of the fastest growing brands in rock music today. A few days before they came on at The Wiltern, they opened for U2 at Gillette Stadium in Foxborough. They’re big and getting bigger. I had seen them before, about 3-4 years ago at The Hollywood Bowl. That concert was an awakening. I had never heard of Snow Patrol before that night. Sitting a level up from the right side of the stage, I didn’t realize I was witnessing one of the best and unique concerts I’ll see. Snow Patrol at the time was young and not well known. Their music had just been introduced to America (from Belfast and Scotland). Their music was excellent, the sound tight, the production pure Hollywood. The rapport established with the crowd at The Hollywood Bowl was phenomenal. Just alot of bantering and funny stories coming from a shy kid and lead singer named Gary Lightbody who seemed awestruck and giddy that he was getting paid to sing his songs. One read of their early struggles and it was no wonder. Combining the acoustics of The Hollywood Bowl made this a night I would never forget. While I enjoy The Wiltern and will always pay to see a performer I enjoy, its acoustics are not on par with The Orpheum and needless to say, The Hollywood Bowl. And, unfortunately, the boys in Snow Patrol have grown up. They’re not as silly or awestruck so the luster has sort of worn off. However, and thankfully, their music survives because of its brilliant composing, truthful beat, hopeful, spiritual and retrospective lyrics, group harmony and genuineness. The production level did not approximate that of the Hollywood Bowl but it was still Snow Patrol and it was still magnificent.